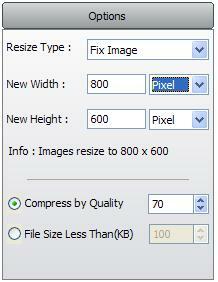 Want to batch reduce picture size, resize your photos? If you have large batch of pictures that you want to qucickly reduce picture size for your website. Or if you have numerous pictures that you want, rapidly batch resize them, to share with your friends via email. Picture Reduce Studio is your best choice. Stop handling pictures one by one any more!Get Picture Reduce Studio Today! Easily reduce your pictures in batch mode. Support imports popular image formats : BMP, JPEG, PNG, GIF ,WMF etc. Tutorial: How to reduce picture size and resize pictures? The following step-by-step guide will show you how to reduce file size of pictures and resize your photos. Click "Start" button to reduce the pictures. After the process is completed, Click the "Open" button to get the reduced pictures.